The day dawned clear at first and prediction was for a hot +35c ! Even with that sort of weather with humidity to match, the gathering was reasonable with around 40 of us braving the conditions. 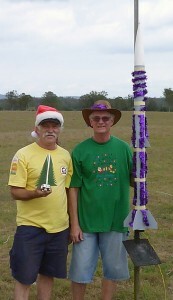 Jase also launched his "1/2 Hawk" twice incl. J381 Skidmark motor...very cool. Thank you Jase for your attendance, it was a pleasure to meet you finally and you are one smart dude planning holidays for Surfers at the time of our launch !Congrat's are in order for Warren who did a successful L1 attempt ! Well done mate ! Ian ( "ogivemeahome") was going to go for a record in his "Red Shift" using D12-0 to D12-7...all went well till the time to try and find the sustainer...poor Ian slogged in heat to look for it but to no avail....we are hoping for farmers help if he happens to find it !It was good to see Mike ( Wingnut) back launching with us and he did a great job with his well built 4" Thor on CTI J354White motor...it went straight up as an arrow and recovery was only 50 meters away ! Great work there Mike and good to see you again !Larry had another cool flight with his 4" "Wildman Extreme" using CTI K360 White motor. 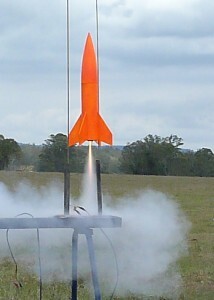 Dean had built a great new launch trailer and it was tested today and all worked well. Thank's for Dean for this new addition and as well Larry who brought his trailer for the launch also. 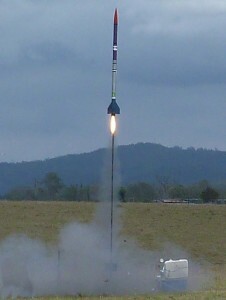 We were presented with a cloudy day with some gusting light breezes but the launches continued, 37 in fact. The sun appeared just about pack-up time. 1. Stewart launched his Excel Plus and managed to find the dreaded corn field but there was a happy ending with all recovered. 4. 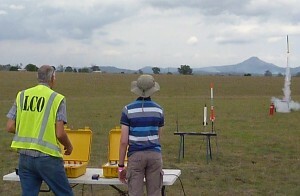 Simon launched his G3 tribrid. Certainly an entertaining set up and launch procedure for the multi fuel rocket.